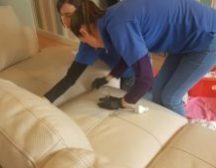 If you are looking for leather cleaning Doncaster you have found us. We will make your leather sofa and upholstery look fantastic again. We are your truly local leather cleaning experts. Not from outside Doncaster and not a franchise or google ad words leads generator. When you book us to clean your leather upholstery. you can rest assured that you are getting the very best leather cleaning Doncaster there is. We only use the very best and most appropriate leather cleaning products on your sofa. There are a few reasons for this. 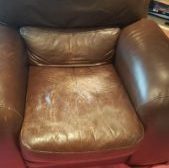 Some leather cleaning firms in Doncaster will use harsh abrasive chemicals to clean your leather sofa. This is because they want to get in and out in a minimum amount of time in order to get to the next job. They are usually employees on minimum wage (or less) and have to complete a minimum number of leather cleans every day. It’s not their fault. But you need to have the very best leather cleaning service available for your upholstery. 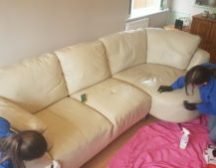 We are a family firm offering leather cleaning Doncaster. Working only in Doncaster we do all of the work ourselves. We have a very high repeat customer take up. It’s because we do as much as we can to provide the very best leather cleaning service we can. 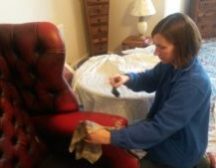 So you can rest assured that we will leave your sofa and chairs in tip top condition. 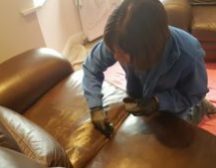 We think that applying a suitable leather protector for your furniture is an essential part of the process. But we include this in the price and will not clean a suite without leaving it protected. Some leather cleaners try to sell this as an extra once they are half way through cleaning your upholstery. But this not good practice at all. The correct protector needs to be selected for your type of leather and applied correctly. 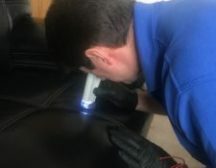 Training to clean leather is not just looking on the internet for a couple of products. A sound knowledge and understanding of all the different types of leather is a must of any leather technician. A lot of damage can be done to a piece of leather using the wrong type of cleaners, strippers or protectors. 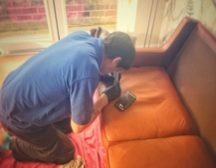 Before we even start to clean your leather sofa, we examine it through the microscope and one or two other tests. So you can be sure that your furniture is getting the correct products every time. Call us today for free advice and a quote over the phone if you want one.